NETTIE HORN is pleased to present Grey Areas, the first UK solo show of German artist Sinta Werner. The exhibition will feature a large-scale in-situ installation as well as several smaller 3-D works and collages. Werner’s elaborately constructed stage, within the main gallery, will structurally and optically disrupt the space by the careful creation of two illusory mirrors, both of which go on to reveal a virtual space behind their apparent presence. Werner’s architectonic installations are developed from different approaches in painting and in particular her aim to extend its very notion. Her interest lies in the in-between state between picture and space through principles taken from the theatrical stage. In that context she engages with the tradition of illusionistic painting and Alberti's metaphor of the visual pyramid. Playing essentially with the architectural aspects of her surroundings, her works deconstruct and fragment the space - creating not merely optical illusions but even elaborate fictitious environments through which the viewer’s vision is deceived. 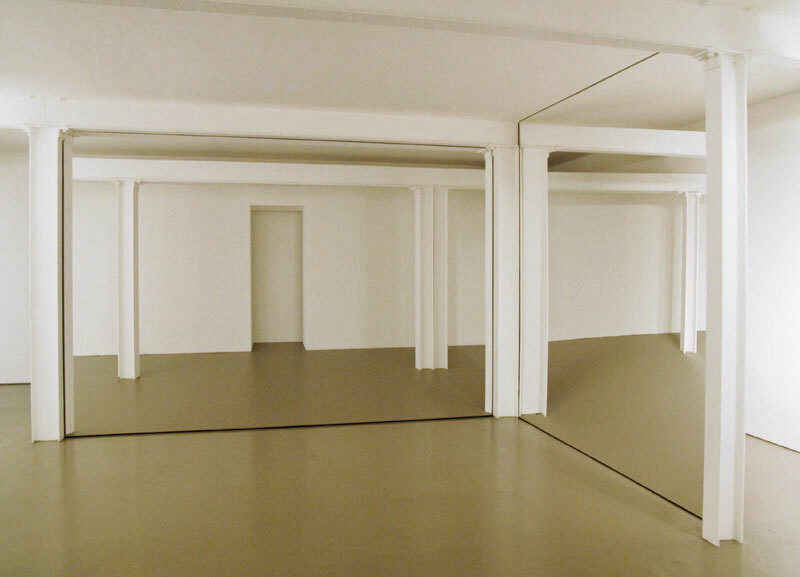 Merging the genres of painting, sculpture, installation and architecture, Werner‘s practice deals with the concept of one-point-perspective – creating a unique viewing point from which the space appears flat and pictorial. Central themes in her work are the illusion of flatness in space and the creation of an illogical and dematerialised scene by representing false perspectives and planes, by the mirroring and doubling of architectural elements or by creating a stage-like set in between two and three-dimensions. Werner‘s response to a site and its architectural qualities enable her to create a setting where the viewer’s senses are questioned. Her aim is to mislead our perception by wrongfooted expectation and disorientation - therefore dissolving conventional ways of seeing and representing. These different scenarios are achieved by various techniques such as collage, pictorial arrangements in space and scenographic installations involving geometrical structures as well as architectural elements. Sinta Werner (b. 1977) lives and works in Berlin and graduated with an MA from Goldsmiths in 2007. Recent exhibitions include The Third Floor at COMA (Center for Opinions in Music and Art), Berlin; Sichtbarkeiten at Projektgalerie Hofmann von Sell, Berlin; Wide Angels at Stedefreund, Berlin; Celeste Art Prize, London; Stopover at ADA Street Gallery, London; Grand Narratives at Gallery Bergstübl-Projekte, Berlin; Kreisis at Gallery Eigeneswohnzimmer; Buntes at Gallery Weißer Elefant, Berlin and Seesaw at Berliner Kunstprojekt, Berlin.